This is a list of the Motorola phones available in the UK market in the 80s and 90s. DynaTAC is an abbreviation of Dynamic Adaptive Total Area Coverage. The Motorola DynaTACs were Motorola's first phones and the DynaTAC 8000X, the world's first hand portable phone. Motorola continued to develop the 8000 series up until 1995, with there being different phones for the US and UK markets. Although by the mid 90s the brick was no longer fashionable, it had a reputation for robustness which meant people in the building trade liked to use these phones, often buying the handsets second hand. 1985 DynaTAC 8000S Cheaper version of the 8000X, still very expensive! 1990 DynaTAC 8800X Improved version of 8500X. 1992 DynaTAC 8900X Improved version of 8800X. 1995 888 Last of the bricks. A favourite with tradesmen. 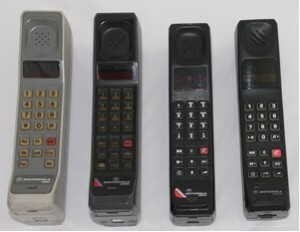 Motorola made a number of phones which were sold either as carphones or transportables in the 80s and 90s. The original series were analogue phones, but Motorola's first digital phone was a transportable, the International 1000. These phones were always a bit more down market than their glamorous yuppie hand portable cousins. Motorola's second GSM phone was the International 3200. The International series was a short run of GSM brick phones. Initially they were the UK's most popular GSM phones. Motorola's MicroTAC series began with the groundbreaking 9800X in 1989. It was the first phone that did not look like a housebrick and quickly became a hugely desirable status symbol to those that could afford the whopping price tag. Later on these phones became the cheap and cheerful end of Motorola's range. Motorola made a huge range of GSM flip phones, as well as PCN versions for One2One and Orange. There were also flip phones without the flip. There was a range of StarTAC phones, running from expensive high status items to cheaper versions for the Orange and One2One networks. 1997 StarTAC Royale PCN Clamshell Mercury version of the StarTAC. Motorola's first consumer phone was the Personal phone from 1992. It was pushed as a phone for emergencies only. Motorola also made bargain basement handsets for the first PAYG deals. 1992 Personal Phone ETACS Cordless phone Early consumer phone with the look and feel of a cordless phone. In 1999 Motorola started two new series of phones. The Timeport for busy executives and the v-series for fashion conscious consumers. I have a mercury one 2 one m200 mobile phone but it doesn't appear to be on the list above. I have been told that it is a motorola manufactured phone...is this correct? "Hi I gave a Motorola mr30 no charger so cannot tell if it works. His much would it be worth, it's the brick type one.